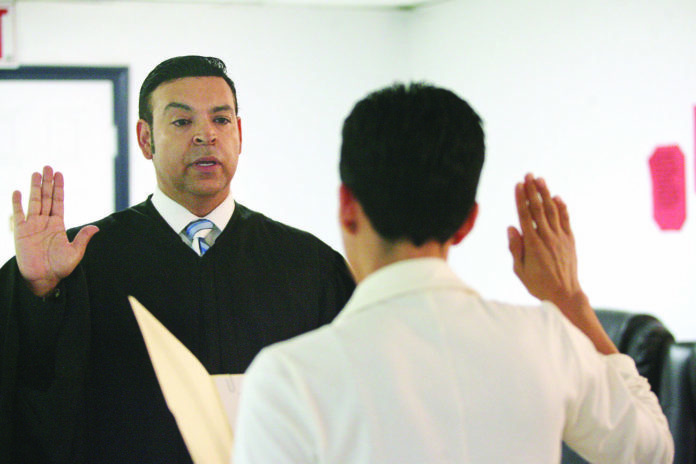 The city of Progreso welcomed a new municipal court judge Wednesday with the swearing in of Orlando “O.J.” Jimenez. Progreso City Secretary Lizett Villarreal administered the oath of office at city hall while a small group of Jimenez’s family and friends looked on. “It’s a huge, huge honor. I’m very, very humbled by this experience,” Jimenez said just before the swearing in ceremony. “I’m very excited about trying to help out the city of Progreso as quickly and as expeditiously as we can. And so I’m very honored and humbled to be given that opportunity here in the city of Progreso,” he said. Jimenez, who had been practicing law for 17 years and maintains an office in Edinburg, also serves as the city attorney and city prosecutor for the city of Edcouch. “There’s a lot of facets; there’s a lot of nuances in the law when it comes to municipal law, when it comes to city government,” he said. Progreso’s chief of police, Alberto Rodriguez, made his introductions with the new judge shortly after the ceremony. The chief shared his excitement about Jimenez’s appointment. “We can work along and expedite any situation that we might have with any certain individual,” the chief said with regard to municipal court business. Prior to Jimenez’s appointment, the city had had to rely on alternate judges to fulfill its municipal court needs. “It was good, refreshing news that we can count on him,” Rodriguez said.